This week another ‘scary GMO cause disease’ story was doing the rounds in internet: A long-term toxicology study on pigs fed a combined genetically modified (GM) soy and GM maize diet. Andrew Kniss, a non-smokable weeds expert, mentioned in Twitter that the statistical analyses in the study appeared to be kind of dodgy. Assess the condition of the stomach and put it in one of four boxes labeled ‘Nil’, ‘Mild’, ‘Moderate’ and ‘Severe’. All this data is summarized in Table 3 of the paper (PDF). How would I go about the analysis? As I see it, we have a categorical response variable—which can take one of four mutually exclusive values—and a categorical predictor (diet). In addition, there is a natural order to the inflammation response variable in that Severe > Moderate > Mild > Nil. Odd ratios for the different levels of stomach inflammation. The odd ratios would be 1 for no difference between the treatments. The graph shows that the confidence limits for all levels of inflammation include 1, so move on, nothing to see. 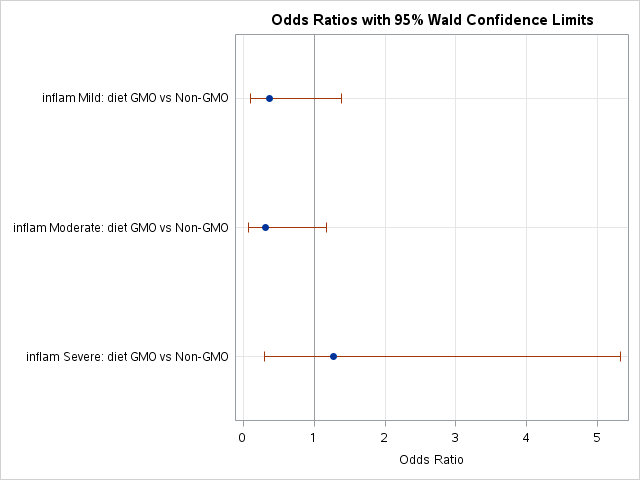 In fact, GMO-fed pigs tend to have less inflammation for most disease categories. P.S. There are many ways of running an analysis for this data set, but I’m in favor of approaches that take the whole problem in one go rather than looking at one class at the time. In an ideal situation we would have a continuous assessment for inflammation and the analysis would be a one-way ANOVA. I understand that for practical reasons one may prefer to split the response in four classes. P.S.2 2013-06-15 I often act as a reviewer for scientific journals. In the case of this article some of my comments would have included: the analysis does not use the structure of the data properly, the photographs of the damaged organs should include both types of diet for each inflammation class (or at least include the most representative diet for the class), and the authors should highlight that there are no significant differences between the two diets for animal health; that is, the trial provides evidence for no difference between feeds. I still feel that the authors should be more forthcoming on terms of disclosing potential conflicts of interest too, but that’s their decision. P.S.3 2013-07-04 I expand on aspects of the general research process in this post. †Tongue-in-cheek, of course, and with reference to weeds. This blog mostly uses R, but I’m pushing myself to use lots of different software to ‘keep the language’. Now if I could only do this with Spanish.